This is Queen Liliuokalani's translation of the Hawaiian Creation chant, the Kumulipo. She translated this while under house arrest at Iolani Palace, and it was subsequently published in 1897. The Kumulipo's composition is attributed to one of Liliuokalani's eighteenth century ancestors, Keaulumoku, just prior to European contact. It is a sophisticated epic which describes the origin of species in terms that Darwin would appreciate. The Kumulipo moves from the emergence of sea creatures, to insects, land plants, animals, and eventually human beings. It describes a complicated web of interrelationships between various plants and animals. The most massive part of the chant is a genealogy which enumerates thousands of ancestors of the Hawaiian royal family. 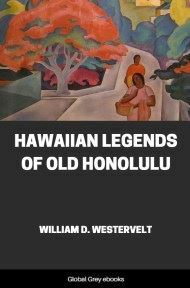 THERE are several reasons for the publication of this work, the translation of which pleasantly employed me while imprisoned by the present rulers of Hawaii. It will be to my friends a souvenir of that part of my own life, and possibly it may also be of value to genealogists and scientific men of a few societies to which a copy will be forwarded. 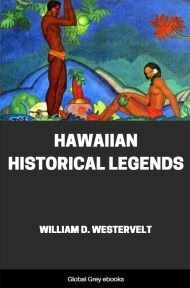 The folk-lore or traditions of an aboriginal people have of late years been considered of inestimable value; language itself changes, and there are terms and allusions herein to the natural history of Hawaii, which might be forgotten in future years without some such history as this to preserve them to posterity. Further, it is the special property of the latest ruling family of the Hawaiian Islands, being nothing less than the genealogy in remote times of the late King Kalakaua,--who had it printed in the original Hawaiian language,--and myself. This is the very chant which was sung by Puou, the High Priest of our ancient worship, to Captain Cook whom they had surnamed Lono, one of the four chief gods, dwelling high in the heavens, but at times appearing on the earth. This was the cause of the deification of Captain Cook under that name, and of the offerings to him made at the temple or Heiau at Hikiau, Kealakekua, where this song was rendered. Captain Cook's appearance was regarded by our people then as a confirmation of their own traditions. For it was prophesied by priests at the time of the death of Ka-I-i-mamao that he, Lono, would return anew from the sea in a Spanish man-of-war or Auwaalalua. To the great navigator they accordingly gave a welcome with the name of Lono. The chanters of this great poem were Hewahewa and Ahukai, and by them it was originally dedicated to Alapai, our ancestress, a woman-chief of the highest rank, then at Koko Oahu. Keeaumoku was lying on his death-bed. The Lonoikamakahiki, of whom this chant sings so eloquently in our native tongue, is none other than Kalaninuiiamamao (Ka-I-i-mamao). His name was also Lonoikamakahiki. He was thus called by his mother, Lonomaikanaka, from the very moment of his birth. It was his grandmother Keakealani who changed his name at the time he was dedicated to the gods and the sacred tabus of the Wela, Hoano, and the Moe; or, translated, Fire, Honor, and Adoration were conferred upon him at the time when his navel string was cut at the Heiau at Nueku, Kahaluu, Kona, Hawaii. The correct name of this chief was Ka-I-i-mamao, but the bards of his day named him in their chants Kalaninuiiamamao; thus he was styled in their Mele or chant called Kekoauli-kookea ka lani. The words "lani nui" were simply inserted by them as it was their intention to hand the young prince's name down to posterity in song, while to explain the object of the parents in naming him Ka-I-i-mamao it signified that when Keawe married Lonoma-I-Kanaka it was an infusion of a new royal blood with that of their own royal line of I, the father of Ahu, the grandfather of Lonomaikanaka. By this it was also intended to show that he, that is Ka-I-i-mamao, was above all other I's, for there were many families, descendants of I, a high and powerful chief, and the last term, "mamao," means "far off" and above all the rest of the I's. Before he was deposed by the people of Kau he was called Wakea on account of his wicked actions, and, like Wakea, he married his own daughter. By this name he wandered through the wilds of Kahihikolo at Kalihikai, Kalihiwai, and Hanalei, and ultimately became demented. Through all his wanderings he was followed by his faithful attendant and retainer Kapaihi a Hilina. This historical character is distinct from the Lonoikamakahiki, son of Keawenuiaumi, the same one who challenged Kakuhihewa at checkers, Konane. He figured at a different period. There were really three persons of the name of Lonoikamakahiki; the first of these was the son of Keawenuiaumi; the second was a celebrated hunchback son of Kapulehuwaihele, and belonged to Makakaualii. The third Lonoikamakahiki is the one for whom this prayer was composed. His parents were Keaweikekahialiiokamoku and Lonomaikaamaka. Ka-I-i-mamao was the father of Kalaniopuu, this last-named being ancestor in the third degree of King Kalakaua, who reigned over the Hawaiian kingdom from 1874 to 1891, and of Liliuokalani, who reigned from 1891 to 1893. He was also ancestor in second and third degree to the wife of Kalakaua, at present the dowager Queen Kapiolani. It will be seen, therefore, that as connecting the earlier kings of ancient history with the monarchs latest upon the throne this chant is a contribution to the history of the Hawaiian Islands, and as it is the only record of its kind in existence it seemed to me worthy of preservation in convenient form. I have endeavored to give the definition of each name as far as it came within my knowledge of words, but in some cases this could not be done because the true signification has been lost. 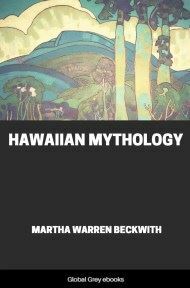 The ancient Hawaiians were astronomers, and the terms used appertained to the heavens, the stars, terrestrial science, and the gods. Curious students will notice in this chant analogies between its accounts of the creation and that given by modern science or Sacred Scripture. As with other religions, our ancient people recognized an all-powerful evil spirit: Mea was the King of Milu as Satan is of the infernal regions, or hell.